Daryl Gregory, author of Pandemonium, The Devil's Alphabet, Afterparty and numerous short stories. A group of traumatized people assemble for an unconventional support group and uncover a dark secret that ties them all together. Arguably Harrison is the lead, a former child “monster hunter” and now an adult lured into a support group with victims of horrific crimes. Ryan Gosling because, well, Ryan Gosling. Or if he’s not available maybe Joseph Gordon-Levitt. "A person who creates scrimshaw is called a scrimshander,” Barbara said. “But the Scrimshander…he doesn’t work on whale bones." 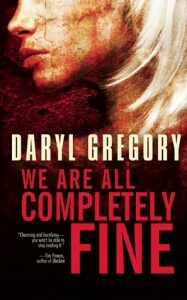 We Are All Completely Fine is something refreshing and unique — a short horror novel that is as much about relationships and people learning from one another as it is about the horrors that they are ultimately facing. Like a real support group, revelations are made and secrets are illuminated (sometimes quite literally) through the interactions of the characters. The support group structure, its goals and philosophies become part of the story itself. As far as the horror goes, the story is more creepy than scary. There are supernatural elements here but the really disturbing stuff is mostly psychological. Above all, however, Gregory excels with the characters. The story, the mystery which is slowly unpeeled, is engaging and involving, but it’s the characters that truly shine. I found myself wanting to read more about them and their adventures. Harrison’s history, for example, is only mentioned, referenced briefly, and yet it’s so rich that I wanted to read about it in its entirety. I also wanted to follow the courses of the characters after the story ended. That, most of all, is a triumph. Even if you’re not much of a horror fan, even if Lovecraft isn’t your jam, We Are All Completely Fine is worth your attention. Just pull up a chair, sit in on the support group. You’ll be drawn in in no time.